Designed primarily for secondary students, ChronoZoom will be fundamental in helping kids understand the big picture. It’s set on the broadest possible scale from the Big Bang to today. There is a lot of featured content already developed and available, with more coming every day. To make it easier to use, Microsoft provides a good set of lesson plans and a user guide, along with a really nice quick reference guide. There is an introductory tour to get you and your students started with ChronoZoom. And there’s a special section of the website just for teachers. 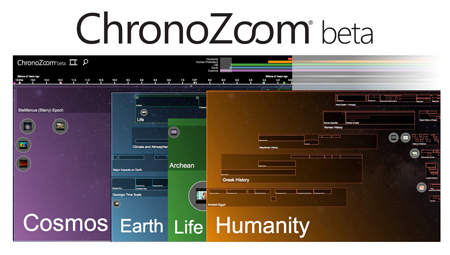 If you create a free ChronoZoom account, you can design and upload your own customized timelines and exhibits. Here’s a step-by-step guide to creating your first timeline. ChronoZoom is the kind of tool that companies normally charge a lot for. So I commend Microsoft for making it open source and providing it free to the world. Take some time today and play around with it. Then get it in front of your students and let them make their own discoveries. Elementary Educators, Have Something to Share?